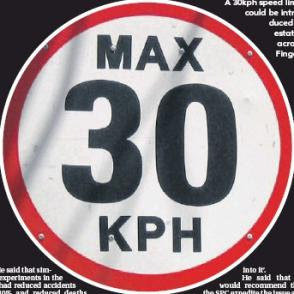 THE council is to invite expressions of interest from the community on piloting 30kph speed limits within housing estates around the county. The experiment is already taking place in some estates in the Malahide/Howth Ward and now Fingal County Council wants to extend the pilot schemes with the agreement of local residents and gardaí. The matter has been expedited by a motion put down at last week's meeting of the full council from Cllr Kieran Dennison (FG), who suggested that lowering the speed limit from 50kph to 30kph within estates, would save lives. He said he did not agree with the 'looney decision' taken in Dublin City to impose the special 30kmph limit on 'major thoroughfares' but he said he would prefer if people 'swinging into estates' had to observe a 30kph limit, rather than 50kmph. He said that similar experiments in the UK had reduced accidents by 40% and reduced deaths and serious injuries to children by half. 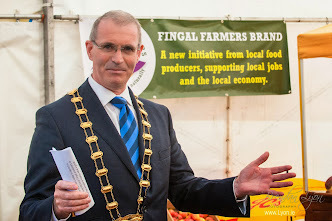 Cllr Peter Coyle (Lab) said there were already pilot schemes running in Baldoyle and Portmarnock but the necessary bye-laws had not been brought forward to give them effect, a point echoed by Cllr Alan Farrell (FG). Director of services at the council's transportation department, Michael Lorigan said the issue was being considered as part of an overall review of speed limits at the council's Strategic Policy Committee on transport. He said to properly enforce a 30kph limit where the council is restricted in its ability to put in engineering solutions that would help enforce the limit, the local community and local gardaí had to 'buy into it'. He said that he would recommend that the SPC expedite the issue and the council should invite submissions in the local press from people who have 'issues in their locality with speed limits'. Armed with that information, he said that special 30kph limits could be dealt with in the first phase of the county's overall review of speed limits.